Week 26| WWN Reflections by @JulietKego: Monetizing Your Unique Passions, Gifts, Talents and Abilities..
Are you an artist, speaker, coach, poet, writer, (or passionate about anything else, for that matter), and you’re looking for ways to monetize your passions? Leadership is service. Artistry is Service. The more people you serve the more successful you’ll be. The more people you serve UNIQUELY the more super successful and fulfilled your life becomes. Simple, yet complex concept. What are your unique talents and abilities? There’s something you do better and uniquely more than 99.9% of the population. Uncover it, develop/hone it (10,000 hours concept as espoused by Malcolm C. Gladwell), package it and then monetize it! (You may need external people to unlock, capture and market it to your target population). Often your unique talents and gifts, may be totally different from what you studied in school and often you’ve unconsciously been building it up or perfecting it in all your jobs and career paths over the years. How do I know? It is something you do effortlessly, seamlessly, stress-lessly, you’re unconsciously competent at it and you’re in FLOW whenever you do it or talk about it. You’re in the ‘zone’ when you do it! Ask your close family/friends for your top skills/talents/abilities and there’ll be at least 2 things they ALL mention. Pay attention! The more you use your unique talents, gifts, abilities, skills, in service of others, the more valuable you become because your level of competence, confidence and influence grows. And gradually, as mentioned earlier, with the right team of experts, you will get an opportunity to articulate, package and monetize your value successfully. Success in life (financial, or otherwise), is less about how ‘good’ you are and more about how you are able to ‘sell’ the perceived value you offer to the world around you. Value is always relative; it is often a somewhat comfortable fusion between what you think or believe you’re worth and what the market perceives you to be worth. The more problems you can resolve and/or, the complex challenges you can simplify with unique solutions, the more success and influence you’ll experience as an artist, leader, professional….For example, an African leader (or specifically Nigerian leader), who can solve the challenges of epileptic power supply will be of great value in the continent than other parts of the world. like North America, Europe or Asia. This is simply because the problem has high priority in his immediate environment. In the same vein, anyone who can provide a crop of reliable, affordable, compassionate, efficient, professional and ethical nannies (referred to as househelps), to busy business or professional women in Nigeria, would be someone of great value and most likely command a hefty pay. The magic often occurs in your positioning skills and the purchasing power of your target ‘tribe’ or population. Sometimes, it’s not about the numbers, rather about the fit and demographics you’re focusing on. Are you geared towards a premium/luxury/niche end of the market, mid-market or mass market? Each of these groups would further be analyzed into key demographics, psychometrics indices for you to be able to capture a healthy slice of your market. Remember, we’re all selling something: salvation, art, comedy, experience, goods, fantasy, reality, services….life is after all an interconnected exchange of values. We live in a world where money is the symbol of exchange, in very stark, practical terms. 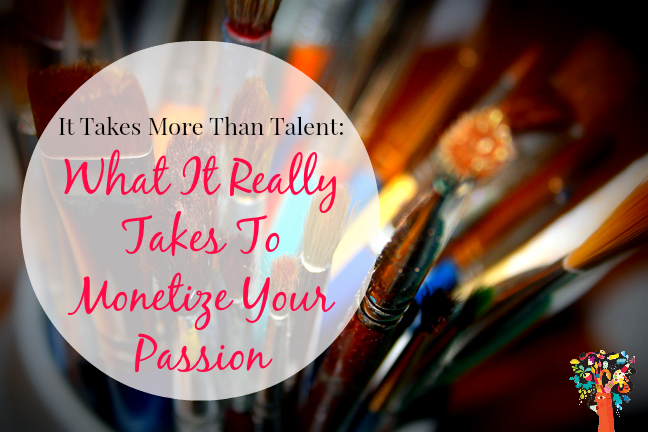 So, it makes sense to pay more attention to how we monetize our passions, gifts, talents, skills and abilities. Why hide your light under a bushel? And if you can get paid sharing what you love to do and be, why not go for it or even get better at it? Don’t need the money? Heck, donate it and keep someone else’s dreams alive!